808 Smith Glass Company is the premier source for commercial and residential curtain walls in Toronto. Dedicated and devoted to contemporary architecture, we design and install curtain walls suitable for any building facade. On request, we can also maintain and repair curtain walls installed by third-party contractors. In architecture, a wall can be load bearing or non-load bearing. When a wall is non-load bearing, exterior glass panels, metal cladding, and thin sheets of stone can be hung between floors. 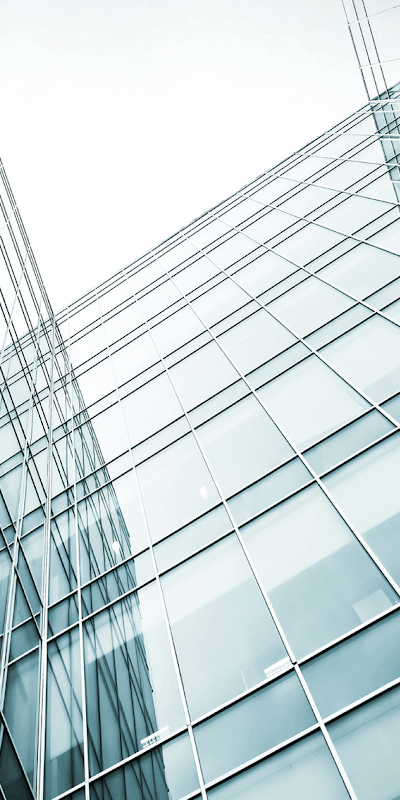 As well as reduced construction costs, curtain wall systems equip buildings with superior thermal efficiency. Enhanced aesthetic attractiveness also lend residential (and commercial) buildings notable style distinction. Curtain wall systems are different from storefront windows and window walls. For the most part, storefront windows are only suitable for installation at ground level. Curtain wall systems are also far more cost-effective than window walls, when incorporated into large architectural projects. Curtain wall systems in Toronto are usually stick system based, or unitized. Common stick system curtain walls are installed in long sections (referred to as sticks) which are assembled on-site during construction. Conversely, unitized (modular) curtain wall systems are fabricated in sections before arriving at work sites. With both stick and unitized curtain wall systems, curtain sections can be composed of transparent glass, stone, or metal. Curtain wall systems equip Toronto home and business premises with several benefits. Chief among these is that fact that curtain walls are visually high-impact. Glass curtain wall systems allow light to flood property interiors. This adds distinctive character and ambiance. Meanwhile, external building facades glimmer, and make striking architectural statements from all viewing angles. As well as aesthetic benefits, curtain wall systems also equip Toronto buildings with several functional advantages. Curtain wall systems traditionally feature in luxury high-rise apartment and commercial building construction. However, curtain walls can be fabricated by us to accommodate almost any building type. Working with Toronto homeowners, 808 Smith Glass design and engineer bespoke structural glazing which beautifies and adds extra functionality to building façades. We transform residence aesthetics, while simultaneously adding market value and increased home energy savings. 808 Smith Glass curtain wall systems, are suitable for a wide variety of luxury residential applications. To benefit from a thorough consultation, call or contact a member of our team today to discuss your project in more detail. Frameless glass bathtub and shower enclosures are the perfect choice for homeowners. No other design feature can so completely transform the look and livability of a bathroom. To experience the benefits yourself, call or contact 808 Glass Walling Installer today for a free, no-obligation initial consultation.